A hugely popular 150-foot Pine River sand slide got special treatment from the U.S. Forest Service recently. Forest officials cut down a number of trees on the bank rim and located them along the barren slide hoping to reduce sand erosion into the river and curtail the antics of passing canoers. 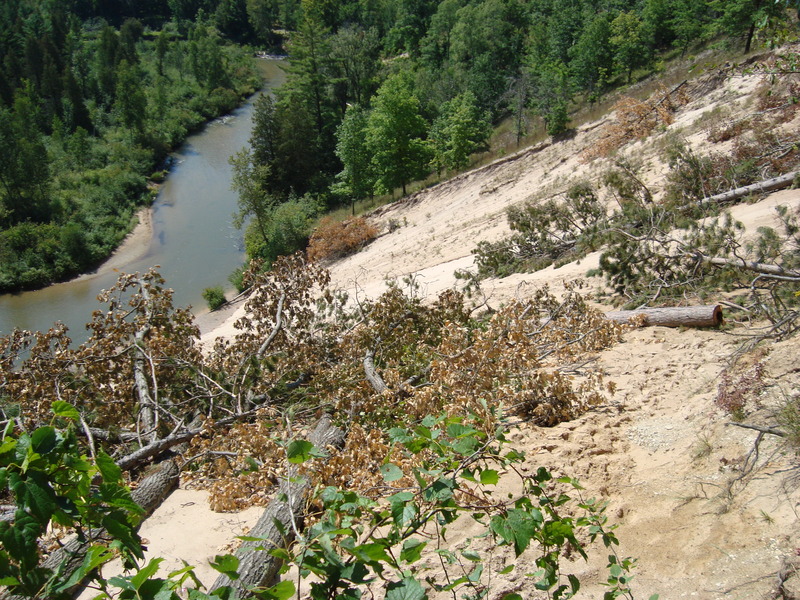 The giant slide is located 2.5 miles west of M-37, downstream from Peterson Bridge. An assortment of YouTube show the antics of those who visit the site, from somersaulting down the slide to riding canoes and kayaks down it. It has become a safety concern, according to Arbogast. It is a congestion concern too for those who are paddling downstream. The problems at the Pine River site go back many years. Here’s a look at some of what takes place there. This entry was posted in Uncategorized and tagged Canoers, Conservation, Environment, Erosion, Huron-Manistee National Forest, National Forests, Paddling, Pine River, U.S. Forest Service. Bookmark the permalink.